Theresa May is unfit to govern and incapable of leadership, SNP Westminster leader Ian Blackford has told the Commons. Speaking at PMQs, Mr Blackford set out how the last 10 years had been the worst decade for wage growth for 200 years, laying the blame on Tory austerity policies. 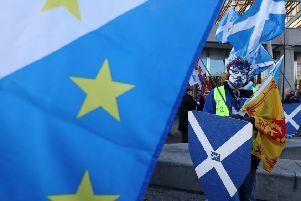 Now she is teetering on the brink of a Brexit that would wreak further damage on people’s pockets, the MP for Ross, Skye and Lochaber said, leaving lower income families hundreds of pounds worse off. “Yet this prime minister still wants to walk off the Brexit cliff edge,” he said. “The Prime Minister is unfit to govern. “She is incapable of leadership. We know it, her backbenchers know it and the country knows it. “10 years after the economic crash and the poorest are still bearing the burden. Mrs May defended her “balanced approach to the economy” and said she was “working to get a good Brexit deal for the whole of the UK, including Scotland”. She added Mr Blackford should listen to the latest views of the Scottish National Farmers’ Union.